Article abstract –Botulinum A exotoxin was recently approved for use in Canada. We describe the efficacy of botulinum toxin in the management of 235 patients with blepharospasm (mean age 64.3 years) and 130 patients with hemifacial spasm (mean age 60.4 years) treated at three Canadian ophthalmologic old centres between 1984 and 1989. A total of 98% of the patients with blepharospasm and 100% of the patients with hemifacial spasm had significant relief of their symptoms; however, 11% of the former and 2% of the latter did not respond to the usual starting concentrations of the drug and needed stronger dosages for relief. The duration of relief varied widely in both groups. Up to 7% of patients had ineffective treatments but responded to subsequent injections. Analysis of variance and linear trend statistics showed that there were no changes in the mean duration of relief over the first several treatments for individual patients in either group. Side effects were transient and included ptosis, exposure keratitis, epiphora and strabismus. In 1978 botulinum A exotoxin was introduced as a treatment for the eye disorders in humans. After detailed clinical trials this drug was recently approved for the treatment of blepharospasm and hemifacial spasm  as well as adult strabismus by the Food and Drug administration in the United States and Health and Welfare Canada. Research trials are continuing to assess the efficacy of the drug for the treatment of spasmodic torticollis, spasmodic dysphonia, or oral mandibular dystonia, writers cramp and childhood strabismus. To examine the efficacy of the drug, we combined our experiences treating blepharospasm and hemifacial spasm with botulinum A exotoxin at three Canadian ophthalmological centres (London, Ont., Toronto and Montréal). By pooling our data we were able not only to include a larger number of patients than have previous studies but also to analyze these patients' progress over the course of many more serial treatments then have previously been reported. Our objectives in this collaborative study were to examine the efficacy of the drug (the rates and duration of relief of symptoms, threshold responses and the incidence of ineffective treatments) and to determine the incidence and duration of any side effects. We report the results of treatments with botulinum A exotoxin given at our three centres between January 1984 and December 1989. We included in our study only patients with a diagnosis of blepharospasm (alone or as part of Meige's syndrome) or hemifacial spasm. Each patient underwent a complete ophthalmological examination before treatment. The treating physician rated the severity of the spasms on a five-point scale, from 0 (no signs) to 4 (very severe spasms). [4,5,7-9,11-15] For all patients whom we treated the rating was 3 or 4. Sites of injection of botulinum A exotoxin for treating blepharospasm and hemifacial spasm. 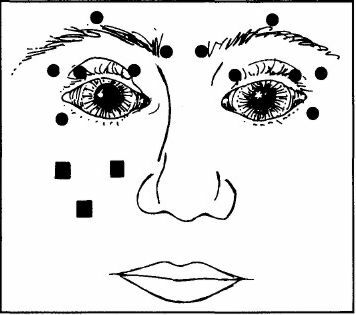 For blepharospasm 12 periocular sites, 6 on either side (shown as circles), are injected; for hemifacial spasm 6 periocular and 2 or 3 perioral sites (shown as squares) on the affected side are injected. After each treatment we reassessed each patient to determine the degree of relief of spasms and the presence of any side effects. We considered a treatment successful if there was an objective reduction in spasm intensity of at least two points on the rating scale or a significant subjective reduction of the symptoms accompanied by improved daily functioning lasting at least 6 weeks. [7,9-13] We defined the duration of relief as the time between treatment and the recurrence of symptoms disabling enough to promote the patient to request another treatment, [5,7,9,10,12-15] not as the interval between the actual treatments, since there was often a delay of 2 to 4 weeks before repeat treatment could be scheduled. We included in the analysis only treatments for which the duration of relief was known. In most cases if the first treatment was not successful we waited the recommended 2 to 3 months  and used the same concentration of the drug for the next treatment. If the second treatment also failed we increased the concentration for the next treatment, generally to double the initial concentration, to a maximum of 10 MU per site. We considered a third treatment failure an indication of nonresponsiveness to the drug. If a patient had an ineffective treatment after at least one successful treatment at the same dosage, we did not alter the dosage for the next treatment. If this dosage failed again, we increased the concentration for subsequent treatments. We documented these failed treatments to determine both the incidence of failure of initial treatments and the incidence of subsequent ineffective treatment in the two groups of patients. We defined initial treatments as the first effective treatment. Some patients did not achieve a threshold therapeutic dosage until the concentration of the drug was increased. Thus, we did not include unsuccessful early treatments for these patients in the statistical analysis of duration of relief. We also did not include ineffective subsequent treatments if the patient had had successful prior and subsequent treatments. We recorded the occurrence and duration of side effects of treatments in the two groups. We calculated the mean duration of relief and standard deviation for each of the first nine treatments for all patients with blepharospasm and for each of the first seven treatments for all patients with hemifacial spasm. To analyze the effect of treatment number on duration of relief within individual patients, we selected the subgroup of patients from each group for whom we had complete data for these treatments. We performed one-factor repeated-measures analysis of variance on the data for the two subgroups to separate the effects of interpatient variability from those of treatment number on duration of relief. We also did linear trend analysis (ratio of linear contrast to standard error of contrast) to look for any trend of increasing or decreasing mean duration of relief within the subgroups. We considered a p value under 0.05 to be significant. We administered a total of 1082 treatments (1 to 19 per patient) to 235 patients with blepharospasm and a total of 336 treatments(1 to 11 per patient) to 130 patients with hemifacial spasm. The characteristics of the two groups are shown in Table 1. Table 1 – Characteristics of patients with blepharospasm of hemifacial spasm treated with botulinum toxin. Fig.2 shows the mean duration of relief of symptoms for the first nine treatments in the blepharospasm group. The duration of relief with the first treatment was not available for 30 patients. The duration of relief varied widely for each treatment. The mean duration for all treatments was 14.4 (extremes 6 and 48) weeks. Mean duration of relief of symptoms and standard deviation (error bars) for first nine treatments for patients with blepharospasm. Numbers in parentheses indicate number of patients. Fig.3 shows the mean duration of relief for the 25 patients for whom we had complete data for the first nine treatments. Analysis of variance showed no significant variation in duration of relief among treatments within individual patients. We also found no significant variation when we repeated similar tests for patients who received between four and eight treatments. Linear trend analysis showed no significant trend in the mean duration of relief for treatment one through nine. Thus, the duration of relief among treatments for individual patients appeared to be consistent over the first nine treatments. Mean duration of relief for the 25 patients with blepharospasm for whom data were complete for the first nine treatments. Of the 235 patients 27 (11%) did not respond to the initial dosage of toxin; 23 of the 27 eventually responded successfully to subsequent treatments at higher concentrations of the drug. Thus, only four patients (2%) did not respond at all to treatment with botulinum toxin. For treatments 2 through 19, of a total of 950 treatments given to the 231 patients who responded to the drug, 70 (7%) were ineffective. The mean duration of relief for the first seven treatments for the patients with hemifacial spasm is shown in Figure 4. The duration of relief was not available for the first treatment for 24 patients. As for the patients with blepharospasm, the duration of relief of symptoms varied widely for each treatment. The mean duration for all treatments was 18.1 (extremes 6 and 52) weeks. 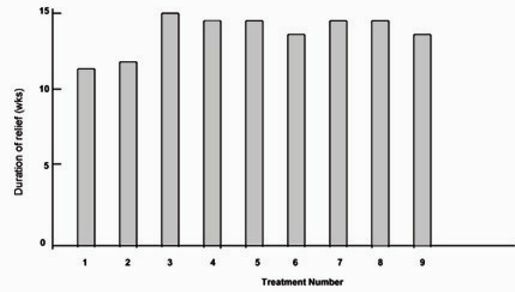 Mean duration of relief of symptoms and standard deviation (error bars) for first seven treatments for patients with hemifacial spasm. Numbers in parentheses indicate number of patients. 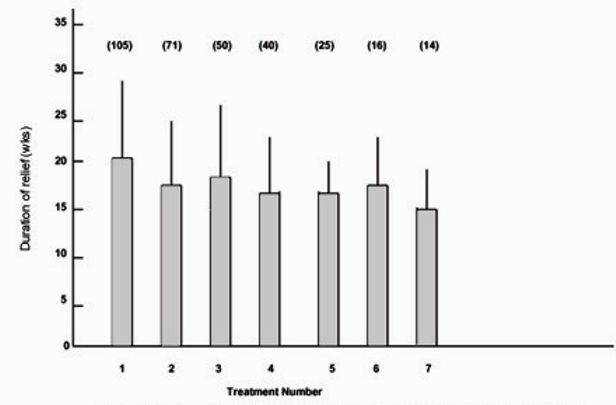 Fig.5 shows the mean duration of relief for the 12 patients for whom we had complete data for the first seven treatments. Analysis of variance showed no significant variation in duration of relief among treatments for individual patients. We also found no significant variation when we repeated the tests for patients who had between four and six treatments. Linear trend analysis showed no significant trend in the mean duration of relief for treatments one through seven. Thus, the duration of relief among treatments for individual patients appeared constant over the first seven treatments. Mean duration of relief for the 12 patients with hemifacial spasm for whom data were complete for the first seven treatments. Two of the 130 patients (2%) did not respond to the initial dosage of botulinum toxin; both responded successfully to a second treatment with a higher concentration of the drug. Thus, all 130 patients responded to initial or higher concentrations of botulinum toxin. Among treatments 2 through 11 of the total of 230 treatments, five (2%) were ineffective. Table 2 – Incidence of side effects. The side effects of treatment with botulinum toxin are summarized in Table 2. The most common side effects, ptosis, has been reported by other investigators. [3-18] In all cases the problems were transient and resolved within 2 to 10 weeks. Patients who experienced dry eye from lagophthalmos after treatment were given artificial tears. None of these patients manifested any corneal complications. Our combined experience in three centres confirms the efficacy and safety of botulinum toxin in the treatment of blepharospasm hemifacial spasm. There is a wide margin of safety between the therapeutic and toxic dosages in humans. The dosages used in treatment do not simulate a detectable antigenic response to circulating toxin. None of our patients experienced any systemic toxic or allergic reaction to the drug. However, none of those authors followed their patients through as many serial treatments as we did, nor did they have as large a sample. Furthermore, they based their conclusions solely on the mean duration of relief for serial treatments. This method falsely skews the mean duration of relief to the lower values for the higher treatment numbers: the smaller number of patients who received the most treatments are those who usually experienced relatively shorter intervals of relief. To avoid this bias we performed an analysis of variance and linear trend analysis to separate the differences in duration of relief among patients from those within individual patient treatment regimens. Only Mauriello and associates  applied an analysis of variance to the duration of response. They also found no change in duration of relief with serial treatments, but they based their calculations only on the first five treatments. From our experience, almost all patients with hemifacial spasm should respond to treatment with botulinum toxin, although a few (about 2%)'s will require higher starting concentrations than usual. We also conclude that up to 98% of patients with blepharospasm should gain relief with the drug, although between 10% and 15% will not respond until higher concentrations are used, as other authors have noted. 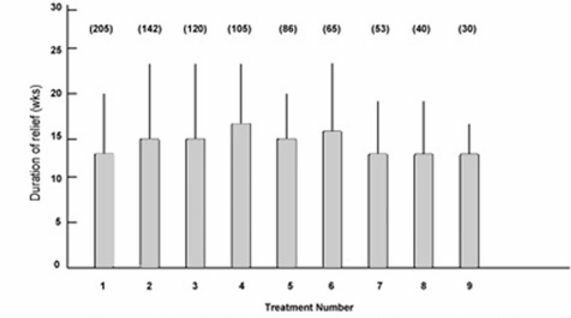 [7,12,14] It appears that there is a subgroup of patients who have a higher than average threshold for response and thus require greater dosages of botulinum toxin to achieve sufficient muscle relaxation for their symptoms to be eliminated. We found that for up to 7% of the patients who responded to treatment, the next treatment, at the same dosage, was ineffective, yet further treatment at the same dosage was effective. We excluded these data from our analysis because we felt that they would lead to incorrect results in the calculation of the effects both among serial treatments for individual patients and among patients. These ineffective treatments may have been caused by local diffusion of the drug away from the muscle end-plates, resulting in subtherapeutic amounts of drug being bound to the end-plates. Alternatively, despite good quality control at the time of drug production, occasional vials of the drug may contain smaller amounts of the toxin or less potent toxin than expected. In such cases the patient should be given a repeat treatment at the same dosage with toxin from a different, fresh vial. If this treatment fails to provide relief, the injection should be repeated with a higher dosage. We agree with Scott and colleagues  that repeat treatments should be at delayed at least 2 to 3 months to allow the release of bound drug from muscle end-plate receptors. A small number of patients who appear to have essential blepharospasm are unresponsive to treatment with botulinum toxin despite marked paralysis of the orbicularis oculi after treatment. These patients suffer from apraxia of opening the eyelid or an inability to voluntarily elevate the levator palpebrae superioris. [2,9,20] We did not include such patients in our study. Because botulinum toxin was until recently under clinical investigation, this treatment was available only in a limited number of centres in Canada, thus requiring some patients to travel long distances to receive treatment. We hope that this article will provide useful information about the treatment and its results and that more physicians will be encouraged to learn about its use so that it will become more widely available in more centres throughout the country. – We thank Mary Chipman and Yong Hao, of the Department of Preventative Medicine and Biostatistics, University of Toronto, for statistical consultation, and Dr. Charles Pavlin, Dr. Milan Tytla and Medical Publications, The Hospital for Sick Children, Toronto, for advice and assistance in the preparation of this manuscript. – Article originally printed in the CMAJ, VOL. 139, NOVEMBER 1, 1988.